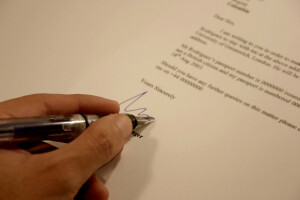 Home › FAQ › Who Should Write Your Letters of Recommendation? If you’re getting ready for the college application process, you may be considering who should write your letters of recommendation. These letters are an important piece of your application and can carry a great deal of weight when it comes to final decisions, according to the College Board. So it’s important that you give some thought and planning about the people you ultimately choose to ask to vouch for you. Teachers, coaches, work supervisors or community leaders are all people to consider. Keep these things in mind when deciding. First and foremost, you’ll need to take a look at each application you intend to complete to see what the requirements are, as every school’s guidelines regarding recommendations may be different. Be sure to take note of how many recommendations are required, whether a certain number must come from teachers, if there is a special form and how letters should be submitted. Not following instructions will fail to impress admissions representatives. When deciding who should write your letters of recommendation, you definitely want to shoot for people who know you well. These references should be able to share information about your character, your top skills, an example of a hardship you’ve overcome or other personal insight that will help to paint an accurate portrait of who you are and will impress admissions staff.It may even be a good idea to think about asking someone whose class was challenging for you or whose sport you stuck with despite the fact that you wren’t the very best player. These kinds of teachers and leaders might actually have the best stories. Because this is a professional recommendation letter for academic purposes, it makes sense that you would want it to be written by someone with good, thoughtful writing skills. That doesn’t mean the chosen person has to be a wordsmith, but try to choose someone you believe will have a great deal to say and who will go beyond the basics. Think about which teachers give helpful feedback on your assignments. Maybe your private voice instructor would be a good choice because she always seems to share a lot of information with your family about your progress during practice. What’s important is that you give this matter some thought and choose strategically. Colleges like to admit well-rounded students. Choosing a group of individuals who know you from all angles will provide the kind of a varied picture they’re looking for. So don’t just choose teachers who will talk about your academic strengths or coaches who are going to brag about your athletic skill. Mix it up a bit and look for references who can talk about your character, intelligence and personality. Finally, when asking someone to write you a recommendation letter, be sure to give them advanced notice. Let them know the deadline and explain any specific requirements. Provide any special instructions like how to access an online form, and always be sure to thank them for their help. These tips should help you decide who should write your letters of recommendation and have you one step closer to your desired school.